Originally intended to churn out larger displays for products like TVs, Foxconn's upcoming $10 billion Wisconsin factory may actually turn to making small- to medium-sized panels for the likes of Apple and automakers in a bid to cut costs, a report claimed on Wednesday. Large panels would have required a more robust U.S. supply chain and a higher initial spend on equipment, said Nikkei, citing people familiar with the matter. One source noted that earlier plans would've required a company like Corning to set up a nearby glass substrate facility, since safely shipping large glass panels would've been difficult. Foxconn owns display maker Sharp, which supplies the some small iPhone screens, and a large amount of iPad displays. At present, Sharp does not appear to be in the running for displays for the 2018 iPhone refresh. Nikkei's sources also suggest that Foxconn is looking to supply iPhone screens from the Wisconsin plant after it goes live. Shipping parts overseas for assembly would likely be a deal-breaker, negating much of the point of U.S. component manufacture. 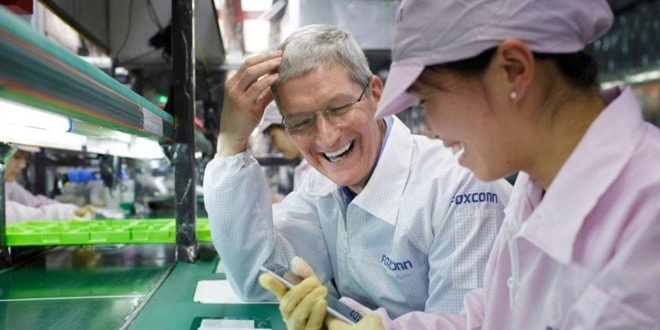 Apple has limited manufacturing in the U.S. The company's current Mac Pro is being assembled in plants in Texas. There is no indication that there is any current assembly of completed goods like the MacBook or MacBook Pro in the U.S. Conceivably, Foxconn could still turn to making TV panels, simply shipping half-finished LCD display cells elsewhere. Samsung and possibly LG are expected to produce OLED panels for two 2018 iPhone models, sized at 5.8 and 6.5 inches. To date Samsung has been the exclusive OLED supplier for the iPhone X, as the only company with enough capacity to meet Apple's demands. Apple is also believed to be working on a 6.1-inch LCD iPhone. Construction on the Wisconsin factory should start on June 28.